Extremely tasty and delicious it turns out in the slow cooker baked potatoes. It can be cooked whole, bake with cheese or make with meat and mushrooms. Any of these dishes will not be ashamed to apply for a festive table. For roasting in a slow cooker, take the tubers are small in size. Peel and wash. Preheat the slow cooker, pour into a bowl with a little vegetable oil, put the potatoes. Salt it, add seasoning to taste. Sprinkle the potatoes with vegetable oil, close the lid multivarki, put the mode "Pastries" 50 minutes. That the potatoes were browned on all sides, using half-hour program, open the lid multivarki and turn potatoes. Put the ready baked potatoes in a deep plate, pour melted butter, if desired, sprinkle with finely chopped greens. 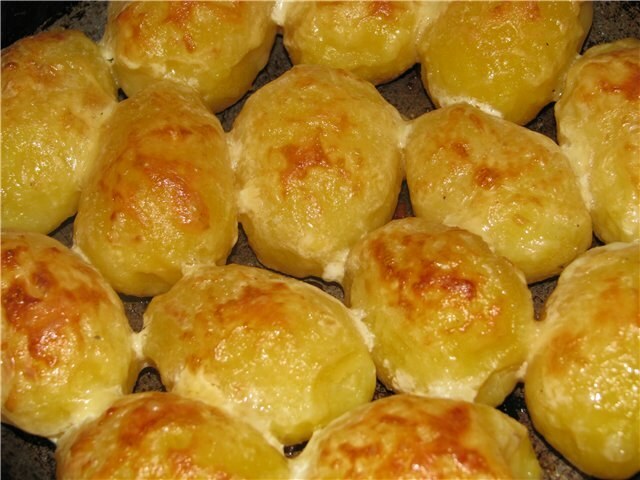 Very quickly in a slow cooker you can prepare potatoes baked with cheese. Take 1 kg of potatoes, 3 sausages, 50 g cheese, 1 teaspoon spices (herbes de Provence), ½ tsp dry garlic or 2 cloves fresh, 2 tbsp vegetable oil, 1 teaspoon of salt. Peel and wash the potatoes, cut into thin slices and place in a bowl multivarki. Add vegetable oil, garlic, pepper, herbes de Provence, salt and mix. Grate cheese on a grater and sprinkle them over the potatoes. Set the mode "Pastries" 1 hour every 20 minutes to stir the dish during the cooking process. Add ten minutes until tender slices of sausage. Potato baked with meat and mushrooms, you will need: 1-1,2 kg of potatoes, 500 g any meat, 300 g of fresh mushrooms, 200 g sour cream, 100 g cheese, 1 tomato, 1 onion, 2 tbsp soy sauce, salt, herbs, spices for meat to taste. Wash, cut the meat into small pieces, put them in a bowl, add two tablespoons of sour cream, same amount of soy vinegar, salt and spices to the meat, stir and leave for 2 hours. Peel and slice the onion into half rings. Wash the champignons and cut them in slices. Pour into a bowl multivarki vegetable oil. Saute the onion and mushrooms until soft in the mode "Roasting". Prepare the potatoes, cut into slices. Put the slow cooker sauteed onion and mushrooms, place in a bowl, half of the sliced potatoes. Dilute sour cream with a little water, add spices. Salt the potatoes, pour sour cream, put a layer of marinated meat on a layer of potatoes, which also need salt. Slice the tomatoes slices and put them on the potatoes, add the herbs and grated cheese. Upon completion of the program you can leave the dish in a slow cooker for 30 minutes in the "heating"mode. Close the slow cooker, setting on 50 minutes mode "Cakes". The finished dish is not that worse than in the pressure cooker.